Here is a list of specials at our location. Visit DunkinDonuts.com for more. Buy 1 Donut, Get 1 Donut of equal or lesser value for free between 7pm – 9pm. Mad Mondays – Get 10% off of a second 31º Below. Twincy Tuesdays – Free small hot chocolate for children aged 5 and under. 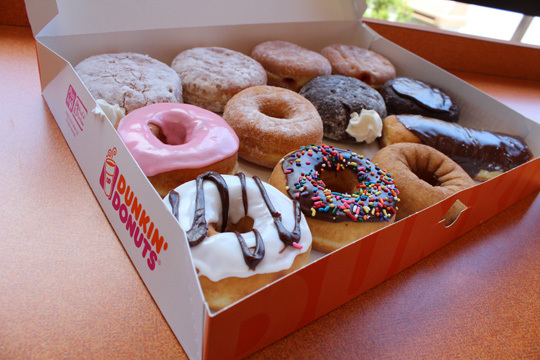 Hump Day Lift – Give everyone in the office a lift with Buy 1 Dozen Donuts, Get 1 Dozen Glazed Donuts for free. Monday - Thursday 5:00 a.m. to 9:00 p.m.
Friday 5:00 a.m. to 10:00 p.m.
Saturday 6:00 a.m. to 10:00 p.m.
Sunday 6:00 a.m. to 9:00 p.m. Phone Number: 704-542-2998 Hours: Monday - Thursday 5:00 a.m. to 9:00 p.m. Friday & Saturday 6:00 a.m. to 10:00 p.m. Sunday 6:00 a.m. to 9:00 p.m.